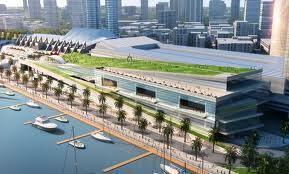 San Diego Convention Center Expansion Project back on schedule to begin construction in 2014, with 2017 completion date. In a ruling issued today, judge Ronald Prager ruled that the funding mechanism for the Convention Center Facilities District that was set up to finance the $520 million Convention Center expansion project is legal and the project can proceed as planned. The CCFD was set up in order to tax hotel owners in the defined district. The fee appears on hotel guest bills at varying rates of three percent for Downtown hotels, two percent for Mission Valley or Mission Bay and vicinity hotels, or one percent for other outlying areas. At issue was whether the hoteliers could legally hold a closed vote among themselves in order to raise an additional tax on hotel guests outside of the city’s existing transient occupancy tax, which currently sits at 10.5%, without having to put it to a public vote. Two separate attempts in 2004 to raise the TOT both failed, despite the March, 2004 measure earning nearly 62% approval of the voters. State law at the time required that any measure proposing to raise taxes of any kind required the approval of a full two-thirds of the voters in order to become law. A second ballot measure in November 2004 earned over 58% approval of the voters. In order to get around that onerous two-thirds requirement, the San Diego City Council and the hotel owners formed the CCFD, which in effect created a Mello-Roos district, allowing the hoteliers to levy a tax on themselves in order to finance the Convention Center project. Ostensibly, the hotel owners could have chosen to assess themselves the fees and operate on an honor system, where all of the hotel owners would pay into a fund that would pay for the massive construction project. A bigger Convention Center, it was argued, would bring in more convention and tourism business to San Diego, which in turn would bring in more business for the hotels. San Diego was losing out on the biggest conventions due to lack of space. And since the hotels closest to the Convention Center would stand to benefit the most, they agreed to a higher assessment than outlying properties. However, the hotel owners decided that it was better to mandate the assessment by law instead of leaving it up to the individual owners to voluntarily decide to pay the tax. As a part of his ruling, the judge found that state and municipal law does allow for certain property owners to be given the right to essentially tax themselves. State law allows that “qualified electors” be defined as “landowners of the proposed district whose property would be taxed if it were levied at the time of the election,” and that only owners whose property would be subject to the tax would be eligible to vote. The CCFD assessment will in effect raise the taxes paid by hotel guests to 13.5% in Downtown hotels, with an additional two percent assessed by the Tourism and Marketing District, raising the total hotel tax to 15.5%. The Convention Center tax is estimated to raise over $30 million per year to be put toward servicing the debt on the bonds to be issued to fund the project. An additional $3.5 million per year will be paid by the City of San Diego, with the port district contributing $3 million more. The ruling puts the project back on track to begin construction in 2014, with an estimated completion date sometime in 2017. What remains to be seen is the effect Judge Prager’s ruling will have on the pending TMD lawsuits. The TMD levies a tax on hotel guests in a similar manner as the CCFD. Read the judge’s ruling here.